Light and fluffy. Quick and easy. 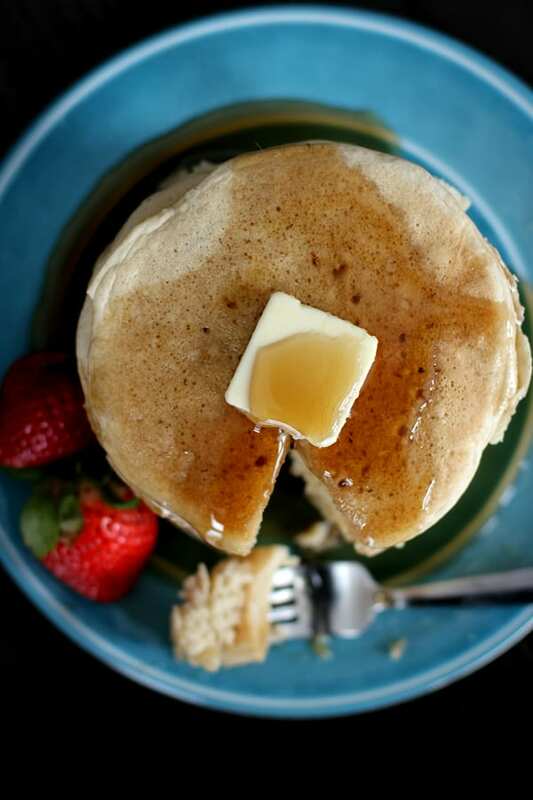 Hands down the Best Buttermilk Pancakes you’ve ever eaten. 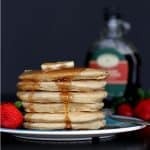 Create a stack a mile high and top with a pat of butter and a stream of maple syrup and you’ll be running to the breakfast table. I don’t toss around the word “best” lightly. After trying and testing numerous recipes, I picked bits and pieces of several and combined them into what I’ve deemed the best of the best. They’re light, they’re fluffy and they’re simply irresistible. If my three year old had her way, we’d alternate between me serving these pancakes or waffles for every meal. She’s quite the carb queen. Put away the box of baking mix! 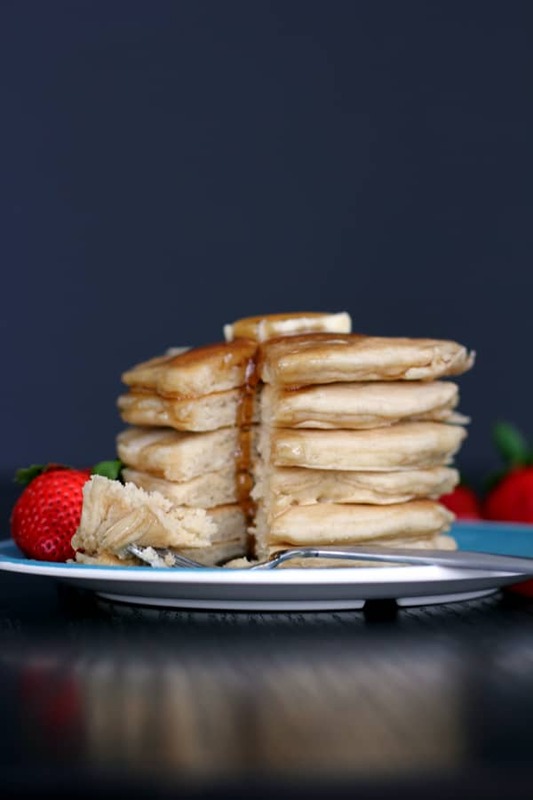 These delicious pancakes are just as easy to make. In fact, I typically triple – yes, TRIPLE! – the recipe for our family of five in the hopes that I’ll have leftovers to stash in the freezer. They’re a popular choice with the menagerie for breakfast and lunch and never last long. What’s that you say? You don’t typically have buttermilk in your fridge? Neither do I! Instead, I use a combination of skim milk and white vinegar. Works perfectly every time! Simply pour one tablespoon of vinegar into a liquid measuring cup and then fill with milk to reach a one cup measurement. Let sit for five minutes and then proceed with your recipe. Easy, right? You know what else makes these pancakes easy? The integrated griddle on my range. LOVE. It’s actually two sided as the other side is a grill pan. As it’s cast iron, it maintains your cooking temperature perfectly which makes preparing a triple batch of pancakes a breeze! Make a well in the center of dry mixture and add milk, egg, applesauce and vanilla. Stir until just combined. 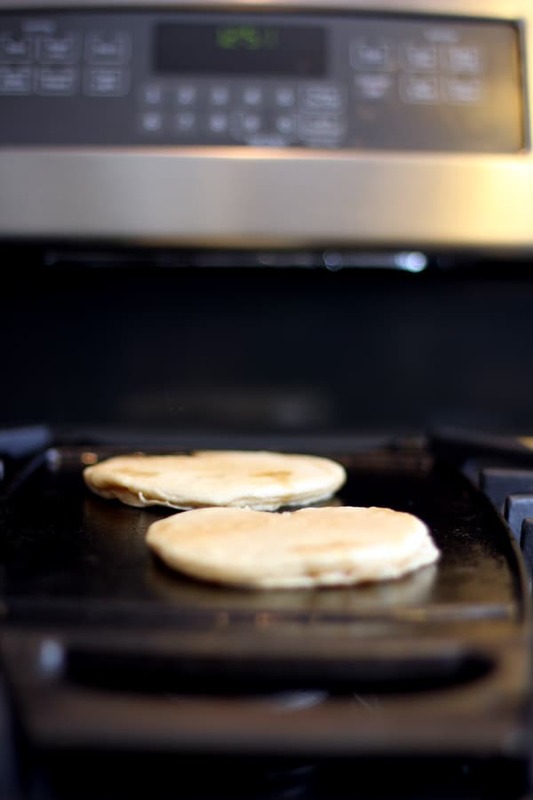 Heat griddle over medium heat and pour 1/3 cup batter onto heated griddle for each pancake. When bubbles no longer appear on pancake surface, flip to cook other side until lightly browned. If your batter looks a bit too thick, use a bit of milk to thin it out to your desired consistency. 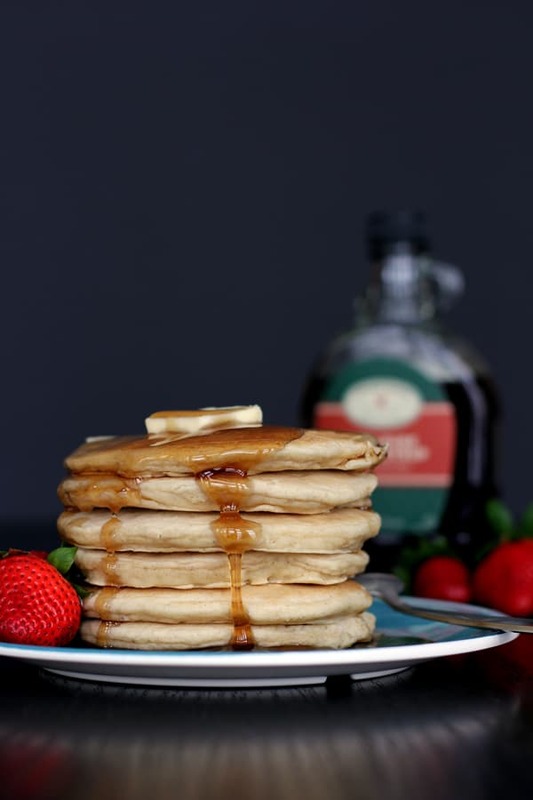 Top a stack with a pat of butter and a river or three of maple syrup and you’ve got yourself the Best Buttermilk Pancakes. My children would both happily live off of pancakes and waffles as well. These looks super yummy. Thanks for sharing at Simple Supper Tuesday. Hi! Stopping by from Saturday Night Fever. 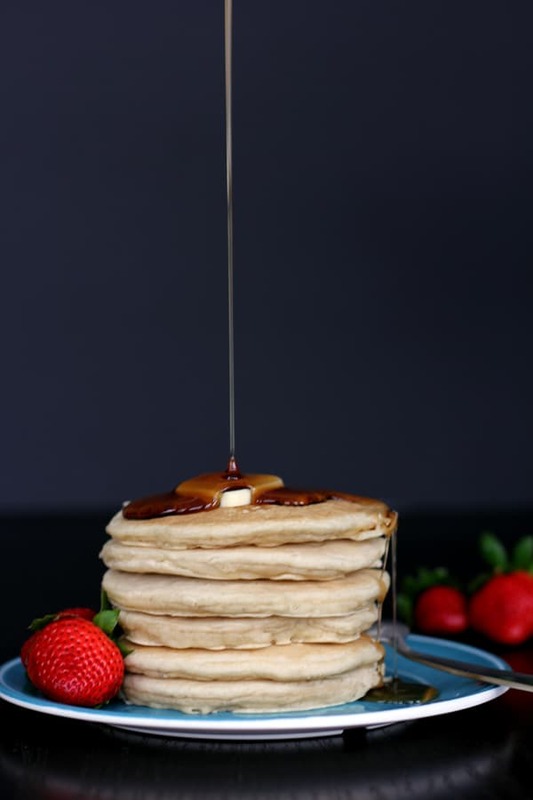 I looove pancakes made from scratch; they're so easy to make, and they taste so much better than the boxed mix. I love the applesauce in this recipe. I'm going to try that the next time I make pancakes. P.S. Your pictures are fantastic! Thank you so much for your kind words - totally made my day! These look good Melanie. We love breakfast for dinner once in a while. I will have to give these a go. On a side note, we were just looking at the same stove you have the other night at Home Depot. Not that we are in the market for a new one. LOL Pretty snazzy looking. :) We were actually contemplating switching from electric to gas. Verdict is still out on that one. But I would LOVE a convection oven for baking. I would also like a 12" burner for bigger pans. Iv made lots of pancake recipes but always was disappointed because they wouldnt raise and be fluffy. They would always be thin even if the batter was thick. Then I came across this tip... after mixing all the ingredients, let the batter sit for 10 minutes without stirring. The batter will begin to bubble ... do not stir. Scoop out the batter with a quarter cup measure and they will spread and rise, it worked. I was very happy with those pancakes. I think it doesnt matter what recipe it is, let the batter rest before scooping. Hey, Beth!I usually do this as well - especially as I'm waiting for my griddle to preheat for my marathon pancake making session! I think this in combination with a larger amount of baking powder (powder = puff, soda = spread) really helps with the "fluff factor." Lol I like your daughter! 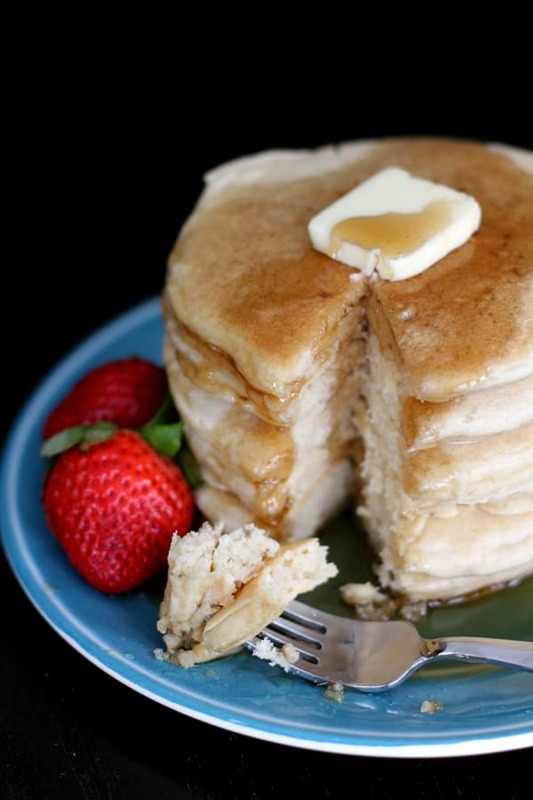 My family used to call me the carb queen :P These pancakes really do look theeee best! So fluffy and perfect! Yum! Hi! I am hosting my first ever Cunning Ladies' Friday Party in my blog. I would love to see you add this beautiful post there. Love your pictures! Silly question....You mention the part about vinegar & milk becoming like buttermilk...but then I don't see either mentioned in the actual recipe? Is that 1 cup of milk/vinegar part of the 2-1/3 cups of milk? Please advise. :) Thank you!